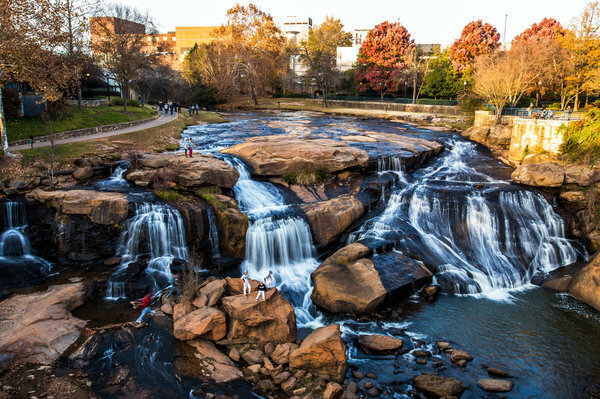 In the heart of downtown Greenville, South Carolina, located in the Historic West End District, is a jewel of great beauty: Falls Park on the Reedy River. Daily, the park enchants visitors with its natural waterfalls, colorful gardens, modern art displays, cutting-edge architecture, and delightful dining. 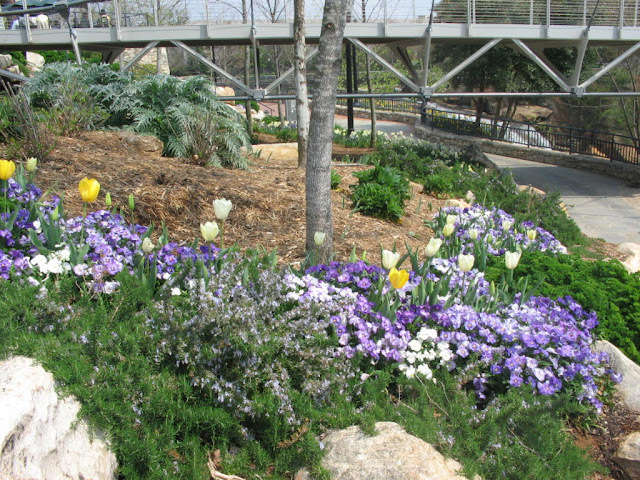 Falls Park on the Reedy shines a delightful aura on Greenville, making it a wonderful community to operate a business, raise a family, or retire. However, no jewel comes out of the earth in its full glory. First, it must succumb to the tools of miners and artisans. So it was with Falls Parks. It all started in 1768 when Richard Pearis established a grist mill and trading post at the base of the iconic falls of the Reedy River. Several years later, Pearis purchased 50,000 acres of land around the Reedy, selling off and bequeathing parcels along the way. In 1852, Furman University bought 50 acres, including the site of the future Falls Park. Industry continued to flourish around the Falls because the water provided much-needed power, but problems with sanitation, industrial waste, and dilapidated buildings turned the once diamond in the rough into an eyesore. It took a concerted effort to restore the land to its original beauty and form it into the jewel it is today. Furman University began a rehabilitation effort of the Falls Park area in 1929, opening the Furman University botanical garden and arboretum. However, the rehabilitation efforts were impeded in 1960 when the four-lane Camperdown bridge was built over the Reedy, obstructing the view of the Falls. In 1967, the Carolina Foothills Garden Club took possession of 26 acres of the land, which would become Falls Park. Efforts were made to clean up the water of the Reedy which was still polluted with textile waste and other environmental hazards. 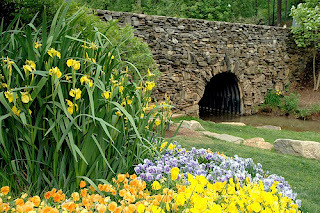 In the 1980s, the Carolina Foothills Garden Club and the City of Greenville developed a master plan for Falls Park to restore the original beauty of the area and provide a delightful, welcoming place for individuals and groups to enjoy. Their master plan, in concert with the city, county, and local universities, brought the Falls Park to the luster that spectators enjoy today. The plan included removing the Camperdown Bridge so the beauty of the Falls could be seen unimpeded. The bridge removal happened in 2002, and the Liberty Bridge was built in its stead. 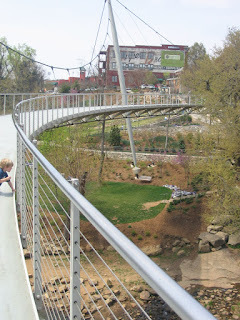 The Falls Park on the Reedy River officially opened to the public in 2004. You can learn more about the history of Falls Park at greenvillesc.gov and friendsofthereedyriver.org. Developing Falls Park into a modern jewel included weaving the historical features and feel of the area with innovative additions. As a result, visitors now have a plethora of fun places to visit at Falls Park. Some attractions are bold and centrally located so all can find them with ease. Other interesting facets are neatly hidden, requiring a little guidance to discover. Here are several sights worth seeing while visiting Falls Park. The Liberty Bridge is a prominent feature at Falls Park. It was constructed in 2003-2004 to replace the view-dampening Camperdown Bridge. Architect Miguel Rosales designed the suspension bridge with a cantilevered cable and curved deck. This one of a kind bridge is among the best pedestrian bridges worldwide and has received international and national awards for design. When you walk across the bridge, you can gaze down at the river below or look out to see the Falls rushing over the slab rocks blackened by water. Turn around, and you can see people enjoying the spacious lawn, strolling on walking paths, and relaxing on benches. Plus, you can observe waterfowl bathing in the river. The Medusa Tree is a hidden treasure worth taking a short hike to discover. It borders Falls Park but resides on the property of the SC Governor's School for the Arts and Humanities. The tree is an American birch with a complex maze of roots blazing through the side of a cliff. This tree, also called the Root Tree, provides a perfect photo opportunity for family and friends. Falls Cottage was built in 1894 and had fallen into considerable disrepair before the Carolina Foothills Garden Club included it in their restoration project. The cottage is a protected landmark on the Historic Register. It has been the home of Mary's Restaurant since 2004 and hosts many private events. The River Lodge is an open-air pavilion located in Falls Park on the Reedy. It is available for rentals for picnics or in conjunction with Old Mill Garden for events with more grandeur. 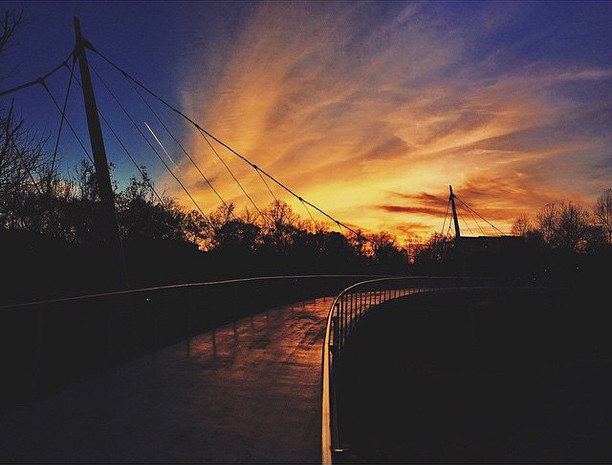 It is located near the southeast corner of the park between the Swamp Rabbit Trail and Furman College Way. 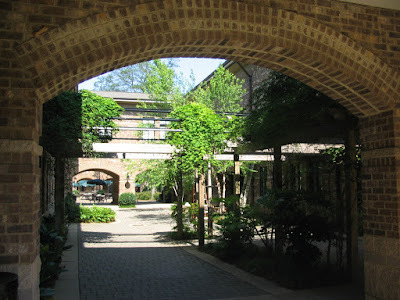 Nestled behind Falls Park, the SC Governors School for the Arts and Humanities is built to resemble a Tuscan village. The residential high school offers rising artists the opportunity to hone their artistic skills in a safe and beautiful environment. Doors opened to its first full-time students in 1999. The school borders the park on the southwest side. The main attraction of Falls Park on the Reedy is the Falls. Plus, it is the namesake of the park. The Falls can be admired from many locations on the terraced landscaping in the park on either side of the Reedy River. People are often seen wading near the base of the Falls or relaxing on the surrounding rocks. However, people are discouraged from climbing (you can see why, after a rain). The ever-growing Swamp Rabbit Trail is over 20 miles in length and runs along the Reedy River, connecting schools, parks, and local businesses. 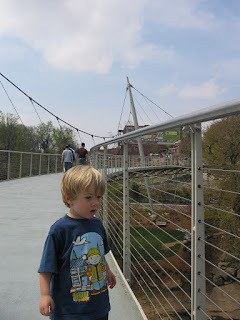 Conveniently, it runs directly through Falls Park, taking you under and over bridges, near the SC Governors School and River Lodge, by Medusa's Tree, and more. Harriet's Garden is one of the hidden gems at Falls Park. If you don't know it's there, you may never stumble upon it. 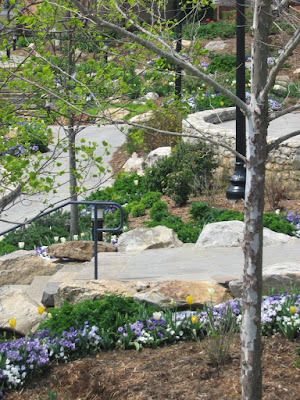 The garden is named in honor of Harriet Wyche, who was instrumental in establishing and developing Falls Park. Harriet's Garden hosts the Rose Crystal Tower, which you can learn more about under Art in the Park. Visitors can find the garden behind the West End Market in Greenville. 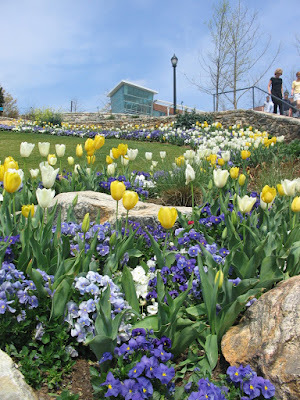 Pedrick's Garden is a two-acre garden near the west end of Falls Park and adjacent to Harriet's Garden. There you can enjoy raised flower beds, a seating lawn, pedestrian bridge, and the lovely Sunflower Fountain. Pedrick was an essential figure in the restoring of Falls Park. Little Falls Park is a quaint and nearly hidden section of Falls Park located at the original site of the 1929 Furman Universities arboretum. There you will find small streams, cascading waterfalls, terraced paths, green foliage, stone walls, and mysterious portals behind rod iron gates. Falls Park has a fine collection of art created by world-renown artisans. Below are four pieces worth note. The Rose Crystal Tower, also known as the Chihuly sculpture, can be viewed in Harriet's Garden in Falls Park. The glass sculpture "was designed to evoke the essence of [Harriet] Wyche's favorite flower – the rose," according to Greenville News. Artist Dale Chihuly created the rose-colored glass sculpture from crystal-shaped Polyvitro pieces. The 22-foot tall tower is a sight to behold. Falls Lake Falls is a reflection pool adorned with a 16-foot bronze sculpture located near the Main Street entrance to Falls Park. The sculpture by world-renown artist Bryan Hunt is one of three in a series and the only one located in our continent. The art piece symbolizes the naturally occurring falls located in the heart of the park. Untitled 2002-2003 is a unique sculpture designed by artist Joel Shapiro in the modern art tradition. The statue is sometimes referred to as the dancing or running sculpture. It is located on the other side the Liberty Bridge when you enter the park from Main Street. Sunflower Fountain is a cast bronze sculpture fountain adorned with sunflower-like spirals that spurt water out of the center. The fountain is located in Pedrick's Garden where you can also see the Sunflower Circle and Sunflower Lawn. The fountain was designed to honor Pedrick's favorite flower: the sunflower. No trip to Greenville is complete without enjoying some local eats and treats. The Falls Park will not leave you disappointed in this area. Besides the numerous specialty eateries located in walking distances from Falls Park in the downtown area, there are options located in Falls Park. Mary's Restaurant serves hungry customers in the historic Falls Cottage. Diners can enjoy a gourmet lunch, a weekend brunch, or schedule a private dinner event. Plan your visit carefully as the award-winning Mary's Restaurant has limited hours. Passerelle Bistro is a casual French bistro located on the upper grounds of Falls Park. 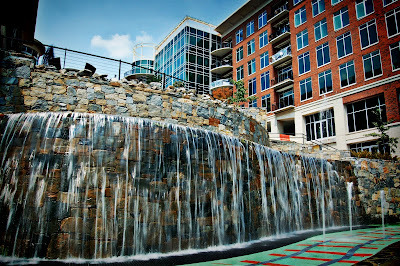 There you can dine under cover or in the open air enjoying the bustle of downtown Greenville and a view of the Falls. The bistro serves fresh and seasonal dishes with iconic French dishes like croque monsieur, ratatouille, and escargot. Spill the Beans is the perfect place to grab some smooth coffee or premium custom-blended ice cream before you set out to walk through Falls Park. It is located near the Main Street entrance. When you live or work in Greenville, South Carolina, Falls Park on the Reedy River can be yours as often as you like. Soak up some sunshine, get some much-needed exercise, and enjoy the beauty. You can not exhaust this jewel as each visit reveals a new facet of its glory and grace. If you are thinking about moving to or retiring in Greenville, South Carolina, the Cunningham Team of Professional Realtors with unique services above and beyond other realtors can help you find the perfect home that meets your needs.